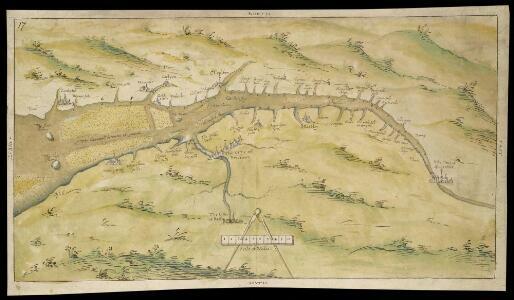 Description: This is a chart showing the Bristol Channel and the River Severn. Sandbanks in the River Severn are indicated by stippling and the draughtsman has indicated the ‘Channell betweene the groundes’. The tributries of the Severn are indicated and figures along the banks record the distance in miles between their mouths. Locations of note, such as Bristol, Bath and Newport are represented by generalised perspective views of houses and churches. The map is thought to date from 1595, reflecting the fear that the Spanish were planning to invade the Bristol Channel in the 1590’s, rather than initiate a more obvious and direct attack via the English Channel. The Anglo- Spanish relationship had steadily deteriorated since the accession of the Protestant Elizabeth I. Raids on transatlantic shipping by English seamen such as Francis Drake and England’s support of the Protestant rebellion in the Spanish ruled Netherlands had brought tensions with Spain to a crescendo culminating in the events of the Spanish Armada. Although the Spanish Armada was defeated by the English in 1588, England remained at war with Spain for many years and further attempts to invade were made by Philip II. In 1595, the year this chart was produced, the Spanish attacked Mounts Bay, Newlyn and Penzance.